Here you can obtain an overview of the care our clinic offers. Select the type of treatment you are interested in. There is no substitute for a personal meeting and consultation. We will be happy to reserve an appointment for your entry examination, at which we shall compile an individual treatment plan on the basis of the current condition of your teeth, your expectations and wishes, which will also detail the demands in terms of the required time and finances. The most important tool for determining the diagnosis and correct treatment procedure is a 3D instrument. Planmeca Promax 3D ProFace, which we use at MDC, utilizes SCARA technology, which is distinguished by its clear images with a reduced dose of radiation. In case of the need to increase the precision of the diagnosis we use a range of further diagnostic instruments and procedures. Planmeca Promax 3D ProFace, which we use at MDC, utilizes SCARA technology, which is distinguished by its clear images with a reduced dose of radiation. It is a genuine all-in-one instrument, producing digital panoramic, cephalometric and 3D imaging. 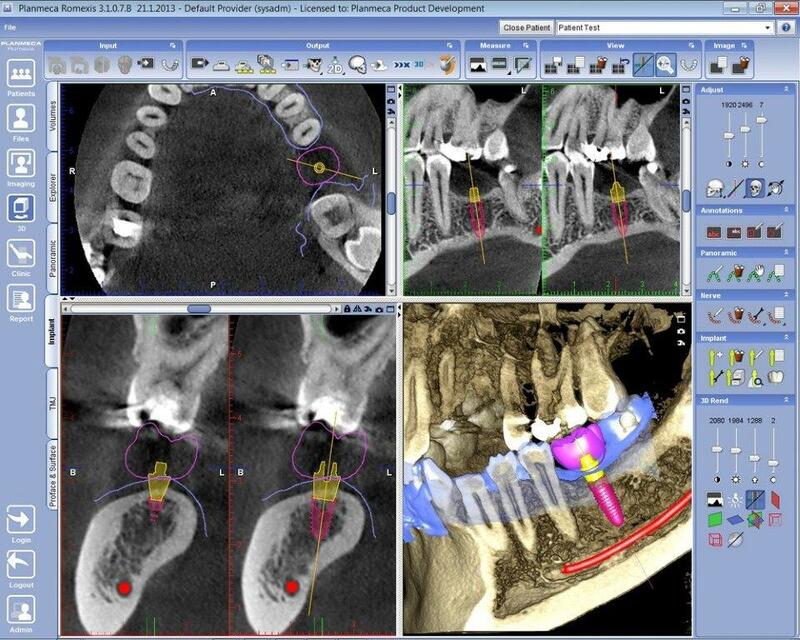 It provides physicians with images of the jaw, jaw cavity and even root canals. It thus meets a large amount of diagnostic requirements in implantology, endodontics, periodontics, orthodontics, dental and jaw surgery and TMJ analysis. At the same time it creates realistic laser 3D photographs of the face for a regular 2D or 3D X-ray image. A 3D image of the face is created by a process without X-ray radiation, in which lasers scan the geometry of the face and digital cameras record the color structure of the face. The 3D photographic image displays the soft tissue in relation to the facial bones and position of the teeth, which makes it a safe and effective tool for orthodontics, maxillofacial and aesthetic procedures. A special lamp emitting polarized light (which does not burden the organism with any radiation), which very sensitively detects pathological processes in the soft tissues to the depth of transillumination. It serves mainly for the prevention and timely detection of affliction of the soft tissue, long before the first clinical manifestations visible to the eye. Use is entirely painless. MDC clinic is part of the worldwide prevention program for diseases of the soft tissues in the oral cavity. This is a camera working on the basis of high-performance light, which detects tooth decay by transillumination. It does not concern X-ray radiation, which means that it can be used without limit on children and pregnant women. Use is entirely painless. All our surgeries are equipped with sensors of the last generation with high resolution, guaranteeing a high-quality image and client safety. Analysis of the pH of saliva is an important indicator of the risk of tooth decay. According to the degree of risk we can choose a targeted, optimal treatment and subsequent form of prevention. The procedure is entirely painless. Saliva is taken directly in the mouth using a special rod. The result is available in a few minutes. Complex and fast solution in cases where only partial treatment cannot provide an entirely optimal result. The unique qualities of the GFR concept (General Fast Reconstruction), which our clinic uses exclusively, consist in its minimal time investment on the client's part, practically painless application and permanent results without the need for any convalescence. There may be several indications for complete reconstruction of teeth. From a wish to improve aesthetic appearance to sudden loss of teeth or threat of the loss of teeth in connection with periodontitis, complete replacement of teeth in the upper and lower jaw, in which the client is not prepared to compromise with a classic prosthetic denture. Complete and fast dental reconstructions are truly the wonder of the 21st century – as well as our specialty. We are able to perform general dental reconstructions successfully, virtually painlessly and with permanent results, mostly thanks to the experience of our team, our own laboratory and modern technologies. The first step in any complete reconstruction is always the initial examination, which serves to obtain all the essential information and data. On the basis of the results the physician compiles a complex schedule for your treatment, including a time and financial plan. This is the least complex type of complete reconstruction. It resolves the unsatisfactory existing aesthetic condition of teeth or the health aspect in the form of uneven bite, which often represents a time bomb of problems which are not visible upon first glance. The aesthetic aspect can be perfectly resolved by ceramic facets. As regards a solution of both the aesthetic and health aspects, ceramic crowns come to the fore. Ceramic facets are thin ceramic plates shaped in order to cover and imperfection, thus perfectly resolving the aesthetic appearance. Teeth may be reconstructed without the dramatic reduction (abrasion) which is necessary for producing a fully covering crown. Complete application takes place at one visit. A ceramic crown replaces the entire upper visible part of the tooth, including the biting surface. The crown “covers” the tooth and thus improves its shape, size and appearance. A number of crowns combined on one bridge help replace a larger number of missing teeth. At each end the ceramic bridge is attached to an actual tooth or implant. A solution in the case of sudden loss of one or more teeth, whereby the client decides to resolve the situation in a complex manner ensuring that the new teeth, together with the already existing teeth, form a perfectly functional and aesthetic whole. The most widespread type of complete reconstruction, in which it is first of all necessary to treat periodontitis, which in most cases has already shown its strength. After the treatment of periodontitis, when it is clear that we can continue work, we perform the actual reconstruction of the teeth. If you have lost all your teeth in the upper or lower jaw, a prosthetic denture may work as a temporary solution. The solution to this situation is the insertion of implants, to which a fixed or removable replacement will subsequently be attached. 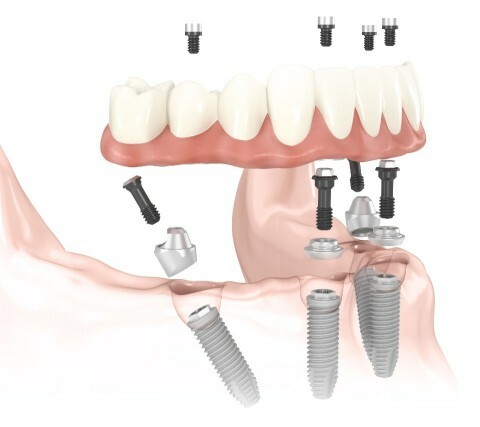 A fixed bridge is permanently attached to the implants, whereas a removable replacement is fixed using various sliding systems. In addition, the load on the bone maintains the jaw in a firm and healthy condition. The dental implant placement is the most natural method for permanently replacing a lost tooth. Implants by Nobel Biocare enable a swift return to everyday activities, since their placement technique is extremely gentle and the healing takes place without any swelling or pain. With the implant you receive a new root, onto which a ceramic crown can be fitted, and you thus gain a first-class new tooth. However, the implant may also serve as a base for a bridge construction in the case that you are missing more teeth. Nobel Biocare implants are produced from titanium with a bioactive surface, which the human body does not perceive as a foreign material and which thus enables better healing. Under optimum conditions implants can be inserted immediately, and you therefore do not have to take time off work and are not excluded from social contact. An invaluable aid in planning implantation is a 3D X-ray image, thanks to which the implant is installed with maximum precision, without the risk of injuring sensitive structures such as nerves and cavities. The Millenium Dental Care clinic is a certified workplace of the Nobel Biocare Company. Correct dental hygiene is the cornerstone of healthy teeth. Professional tooth cleaning by a dental hygienist is a prophylactic step (prophylaxis = targeted prevention), preventing the onset of gum inflammation. At the same time it constitutes a part of the treatment for existing periodontitis. With the use of professional whitening systems we can brighten up your smile up to several shades. Professional tooth cleaning involves surface removal of tartar, removal of the soft coating – plaque, removal of pigment stains from coffee, tea, smoking etc. and final local fluoridation of teeth. Cleaning is done in a non-invasive manner and is typically painless. If you suffer from sensitive teeth, we can offer you a local anesthesia – gels, sprays or local anesthetic injections. Regular professional cleaning, together with correct home care is the most effective protection for healthy and beautiful teeth, which will last you a lifetime. Removal of pigment stains, known as “air/flow polishing”, is an aesthetically-oriented dental hygiene procedure. It is suitable especially for smokers and clients whose teeth are stained by coffee, tea, red wine etc. It is extremely useful for dental hygiene in clients with fixed braces (dental braces) who experience difficulty adequately caring for their teeth at home. However, everyone’s teeth are different. It is therefore essential that whitening program be selected by a dentist who takes into account your individual needs and characteristics. We achieve the best results by combining in-office and home whitening systems, tailor-made to your specific needs; this is called the Individual Bleaching Concept. To maximize your results, we recommend that before the whitening session you have your teeth cleaned by a hygienist. All of your teeth must be in good condition. Unhealthy or not fully treated teeth, missing or compromised fillings must be treated prior to whitening to ensure your comfort. Periodontitis is a chronic condition affecting the periodontium, gums and alveolar bone. The word “periodontium” literally means “tissue surrounding the tooth”. Periodontitis is a chronic bacterial infection which, if left untreated, can lead to tooth loss. The main cause of periodontitis is bacteria in the form of sticky, colorless plaque which is continually forming on the surface of teeth. With milder forms of periodontitis we utilize mechanical (non-surgical) treatment in combination with adjustment of home dental care. Mechanical (non-surgical) treatment of periodontitis consists of removing all pathogens (plaque, tartar and granulations) from the entire tooth surface, including under the gums (from the surface of the root). With more severe forms we utilize a combination of mechanical (non-surgical) therapy and targeted medication. To ascertain the types and quantities of bacteria causing the periodontitis we take samples of microflora from the affected areas and send them in a patented transportation medium to a specialized microbiological institute in Switzerland. The result is the stipulation of a precisely targeted medication treatment, which we apply concurrently during the course of mechanical therapy. The therapy is typically divided into several visits, depending on the client's current condition. It takes place under local anesthesia and without the surgical intervention that was previously necessary for this type of treatment. Preventive dental care is not considered an unpleasant and unnecessary procedure, but rather a rational choice which protects clients from several health problems in future, and also saves money on costly medical procedures. For children this is all the more true. The prevention program for adults resides primarily in regular checks with a dentist and regular professional tooth cleaning. Regular professional tooth cleaning represents the most effective prevention against the onset of tooth decay and the incidence of periodontitis. Thanks to regular checks with a dentist it is possible to identify any problem immediately in its inception. For example, tooth decay which has not yet penetrated into the deeper structures of the tooth can be treated without drilling, in which it is sufficient to apply HealOzone. Whether this represents tooth decay or another dental problem, with regard to visiting the dentist the principle always applies that “the sooner, the better”. Pay attention to your teeth and comfort, and don't wait for the situation to deteriorate. Pain could mean serious damage to your teeth – once it manifests itself fully it may be too late to save your natural condition. Healthy teeth throughout life are a reality that we can bestow upon our children. The preventive program of the Millenium Dental Care clinic is designed for children from the age of 3 years, i.e. from the age when active co-operation of the child can be expected. It resides in regular treatment every 6 months, which gradually develops just as children's teeth develop. The foundation on which the entire preventive program is built is a check with a dentist and subsequent dental hygiene in connection with an analysis of saliva, in which we determine its pH. Analysis of saliva pH is an important indicator of the risk of onset of tooth decay, and according to the degree of risk we can choose a targeted, optimal form of prevention. Another important factor of successful prevention is complete treatment of teeth with HealOzone. This is painless and non-invasive prevention of tooth decay (sterilization of the surface of the teeth) or treatment of incipient decay, without the necessity of preparation. The extended warranty is conditional upon adherence to the clinic's preventive program. Unfortunately there are many people who suffer from dental phobia, or fear of the dentist. Dental phobia can have a range of negative consequences. The fact that it can result in damage to the client's teeth is easily understandable, but in serious cases this phobia can lead also to states of anxiety or depression. Dental phobia is often caused by previous traumatic experiences in the dentist's chair. Regardless of whatever has caused you to fear dental treatment, we're here to help you. When caring for our clients’ dental health, we try as much as possible to eliminate any fear, anxiety, or pain. We employ a variety of methods to make our dental treatments as pleasant as possible. In the case of persistent uncontrolled anxiety we usually perform treatment with inhalation of laughing gas or treatment under analgosedation. Our extensive experiences have shown us that this method provides a high degree of certainty that the client will practically not experience pain or swelling, and will have no memory of the procedure. Undergoing a dental treatment has just become easier even for clients with dental phobia. A watershed in treatment is the approval of the use of nitrous oxide (N₂O), or “laughing gas” in outpatient treatment in the Czech Republic. The use of laughing gas for a variety of medical procedures is widespread abroad (UK, USA), here this “sweetener” took a long time to reach clients. This is an effective inhalation analgesic for both adults and children. The main benefit of nitrous oxide is its anxiolytic effect – alleviating anxiety. It is therefore ideal for pediatric clients and for clients who suffer from fear of dentists or needles (necessary for injection of local anesthesia). The application of laughing gas is very easy, and takes place via a demand-valve inhaler (dosage only upon breath intake), or via a nasal mask (constant inflow). Laughing gas is a compound of 50% medical oxygen and 50% nitrous oxide. It takes effect very rapidly, only a few inhalations are required. The effect subsides within 5 minutes, and after 30 minutes the client can safely drive a car. In the majority of cases laughing gas is very well tolerated. In rare cases clients may experience mild dizziness, euphoria or slight nausea during inhalation, but this rapidly subsides after the end of inhalation. Another option for clients with dental phobia is to undergo treatment under analgosedation. This is a state of a reduced level of consciousness, in which you are calm, relaxed and free of fear and feel no pain. After the procedure the client remembers nothing of the course of the procedure. This very safe procedure is applied without artificial ventilation, and there is no need to sleep off its effects. Within 30 minutes after the procedure you will again be fully conscious, alert and fit to go home. A specialist – anesthetist will be present throughout the entire procedure. Up to one half of all clients experience unpleasant moments at the dentist due to their wisdom teeth. Thanks to the possibilities of modern medicine, our experienced specialist can treat you under analgosedation, in which any unpleasant feelings and fear are eliminated. or treatment of root canals is a procedure treating inflammation of dental pulp. Every tooth has a hollow socket area, into which tip of the root leads – the root canal. This contains live tissue – dental pulp. If inflammation of the dental pulp (pulpitis) occurs, which may be caused e.g. by very deep decay affecting the dental pulp or its immediate vicinity, the only relief from pain is endodontic treatment. Endodontic treatment consists of thorough cleaning of the entire inside of the tooth. It is necessary to precisely remove all of the diseased pulp and carefully fill the ensuing empty cavity with a suitable material. Every tooth is different, the number, shape and length of the individual root canals differ considerably. Surgical operating microscope Carl Zeiss is an invaluable aid in this very detailed treatment. It enables multiple magnification of the treated area, so that the physician can see even the smallest structures that are invisible to the naked eye, ensuring the highest accuracy and precision during treatment. All surgical treatments at our clinic are performed in outpatient regime. For the sake of comfort clients can choose treatment under analgosedation, or with inhalation of “laughing gas”. Painless treatment of cavities without drilling. The treatment consists of the application of ozone (O3), which is a strong oxidizing agent capable of destroying the tooth-decay bacteria, painlessly and without any side effects. Treatment with HealOzone is suitable for use on incipient cavities which haven’t yet penetrated the deeper structure of the tooth. It is also as prevention for treatment of the biting surfaces of the teeth within the framework of dental hygiene. Straight teeth without the use of wires! If you suffer from uneven teeth (e.g. slight crossing or crookedness of teeth) and do not wish to wear classic dental braces for professional or other reasons, we have an effective solution for you - “invisible” braces. With the use of thin, transparent aligners, we will succeed in discretely realigning your teeth. You can expect results within a few weeks! Your dentist creates an exact replica of your current set of teeth which is then sent to a specialized laboratory in Germany. Here your individual aligners are made. The number of aligners differs according to the individual requirements of the client. Each successive aligner’s shape approximates the target position of the tooth. When worn regularly, the aligners move the teeth into optimal position. The final aligner brings the teeth into their final, straight and even shape. Since the aligners can be removed at will, it is up to you, how conscientious you will be about your therapy. The more often you wear the aligners, the sooner you will attain the desired result. This sophisticated method is capable of detecting defects of your bite and stipulating an optimum mutual position of the jaw. According to the results of this analysis we are able to adjust the teeth into the ideal position, in order to avoid overloading of the jaw joint. Why is it important not to overload the jaw joint? Overloading of the jaw joint impairs overall physical harmony. In addition to chronic headache, pain in the area of the neck, shoulders, back, spine and joints, it has an impact on sleeplessness, grinding of teeth and snoring. Grinding teeth and clenching the jaw, known as bruxism, may often be caused by stress and anxiety, or as a consequence of sleep disorder. Another frequent reason is an unstable bite, which is caused for example by missing or crooked teeth. In the majority of cases grinding of teeth occurs during sleep, so the client is unaware of the problem. A frequent indicator is pain upon waking or constant dull headache. If bruxism is not treated, grinding may lead to loosening, damage or loss of teeth. Bruxism also influences the joints and muscles, and may cause headaches and be a cause of joint disorders. What can you do to stop bruxism? First contact your dentist, who will determine the cause of bruxism and recommend a suitable treatment. In the majority of cases the first option of treatment is a guard in the form of an individual model on the upper or lower jaw, which the client places on the teeth before sleeping.